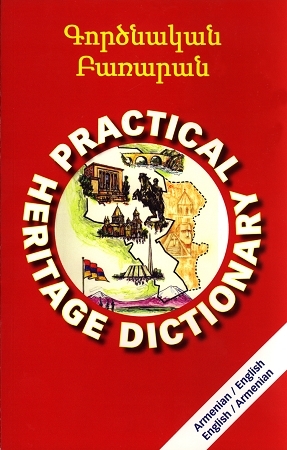 Practical Heritage Dictionary: English-Armenian/Armenian-English is an easy-to-use reference book filled with close to 3,000 entries. The dictionary provides simple and accurate definitions to everyday words and is geared towards anyone looking to improve his or her knowledge of the Armenian language. Colorful illustrations also bring a particular visual appeal to the volume. The dictionary is unique in its thematic subdivisions and accessibility for people of all ages. It includes a transliteration of each Armenian word, Armenian Church vocabulary, definitions of some of the most commonly used words in the English language as well as entries that reflect our newly globalized world and recent innovations in technology. This dictionary is not intended to replace a more comprehensive, bilingual dictionary used in literary or scientific translation, but it is a handy, reliable companion for any aspiring speaker of conversational Armenian.